Back in mid-December, new Phillies general manager Matt Klentak completed one of his first trades, sending organizational pitcher David Whitehead to the Pittsburgh Pirates in exchange for veteran starting pitcher Charlie Morton. The move was made to add an eight-year veteran to a rotation that was going to be relying heavily on a handful of inexperienced starting pitchers, while another handful percolated at the top of the club's minor league organization. Morton had made 157 big league starts, most of those coming in seven seasons with the Pirates, who had acquired him back in June of 2009 from the Atlanta Braves club that had drafted him back in 2002. So Morton was slotted into the rotation as a veteran innings-eater, someone who hopefully would provide the team with 15-20 starts leading up to the 2016 MLB trade deadline. 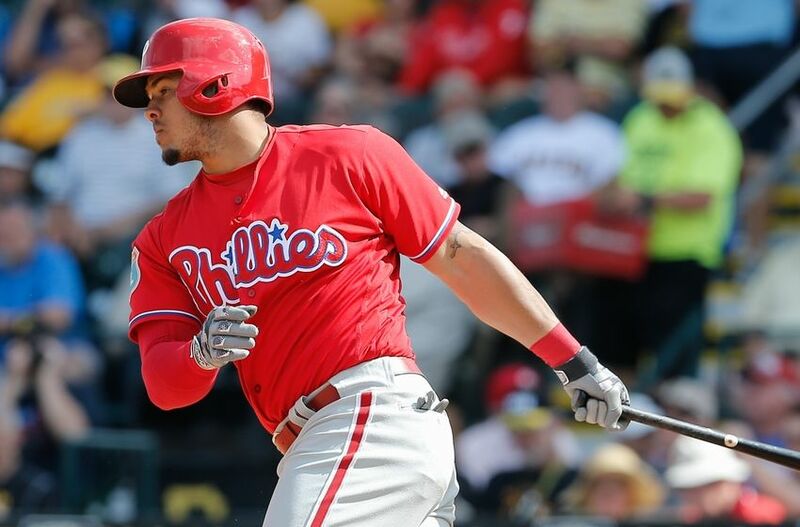 The Phillies organization suffered a temporary setback with yesterday's announcement that TBOH Phillies #6 prospect, catcher Jorge Alfaro, would likely miss more than a month due to an oblique injury. While that is indeed a setback, especially considering how well Alfaro was hitting this season at AA Reading, the Phillies do still have a highly regarded catching prospect who is even further along in his development. On ranking the Phillies top prospects back in February, our TBOH staff lumped catcher Andrew Knapp in with a few others as the #10 prospect in the organization. Knapp has come out here in the 2016 season like gangbusters, picking right up where he left off his stellar 2015 campaign. To date, Knapp is hitting for a .364/.517/.682 slash line with two homers, six RBI, and seven runs scored over an admittedly, as our Ethan Witte likes to say, "small sample size" of 29 plate appearances. "He's only had one at-bat where he has forced something and swung at a couple of bad pitches to get himself out," said Sal Rende, the AAA Lehigh Valley IronPigs hitting coach, per The Morning Call's Tom Housenick. "Otherwise, he's been very impressive." 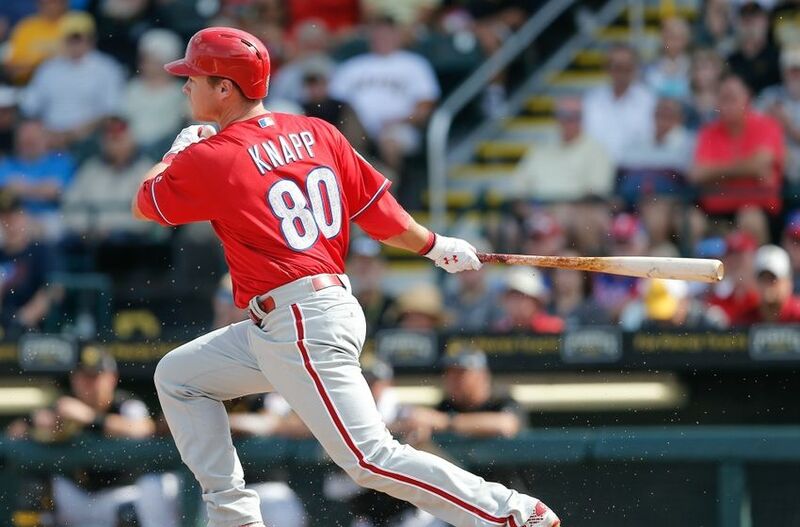 But for Knapp, this is again building off that outstanding 2015, a season after which he was named as the Phillies' organizational Paul Owens Award winner among the position players. In that 2015 campaign, Knapp hit for a .308/.385/.491 slash line with 13 homers, 35 doubles, and 84 RBI while catching in 94 games split between High-A Clearwater and AA Reading. Knapp is a California native. He was the Phillies 2nd round pick in the 2013 MLB Amateur Draft out of the University of California-Berkeley. Now 24-years old, he has risen incrementally but steadily through the club's minor league system, and is now on the cusp of his first big league call-up. That call to the Majors could come at some point this summer. 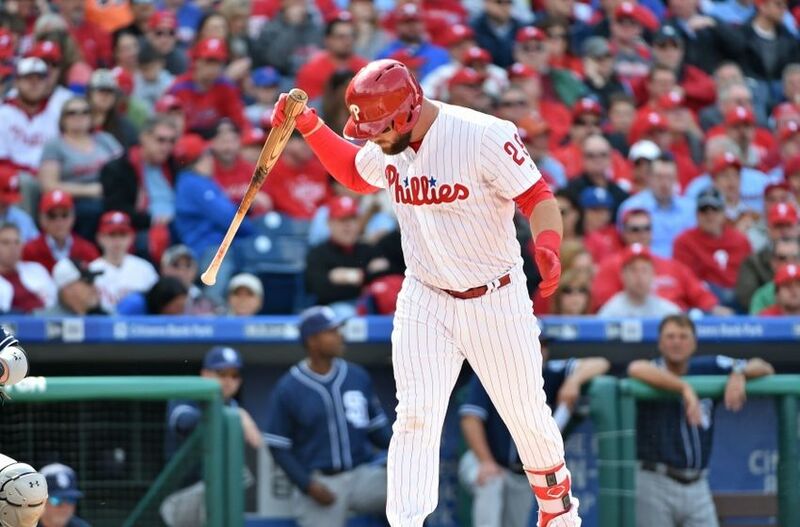 With veterans Cameron Rupp and Carlos Ruiz currently handling the backstop chores for the Phillies, there is no need to rush him. But Ruiz is clearly in his final season with the team after a championship career, and could be dealt before the summer is out, creating an opening. Knapp will be ready when that call comes. 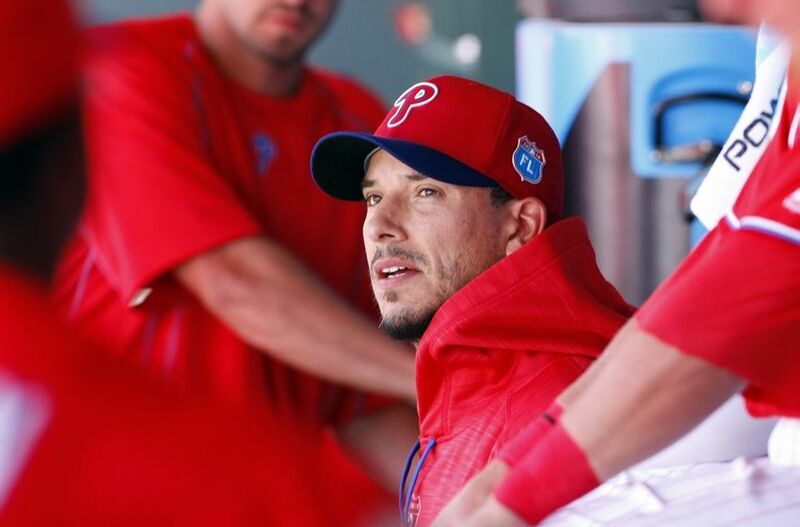 Whether it is he or Alfaro who ultimately emerges as the Phillies' catcher of the future is yet to be determined, but assuming his own health, Knapp will get the first shot. Catcher Jorge Alfaro, rated here at TBOH as the Phillies #6 prospect in our 2016 preseason evaluations, has suffered an oblique injury while playing at AA Reading. While the severity of the injury is to be determined, it is likely that Alfaro will be out for a number of weeks. The injury is particularly unfortunate for Alfaro and the organization as a whole. He was off to a scorching hot and impressive beginning to this season, batting at a .500/.526/.750 slash clip. Alfaro had a half-dozen extra-base hits, and had driven in 10 runs over his first eight games played. Just yesterday, Alfaro was named as the Eastern League's Player of the Week thanks to his hot start. Just today, MLB Pipeline named Alfaro and Phillies' prospect shortstop J.P. Crawford, a teammate of Alfaro at Reading, as one of their Top 10 Prospect Combinations in the game. 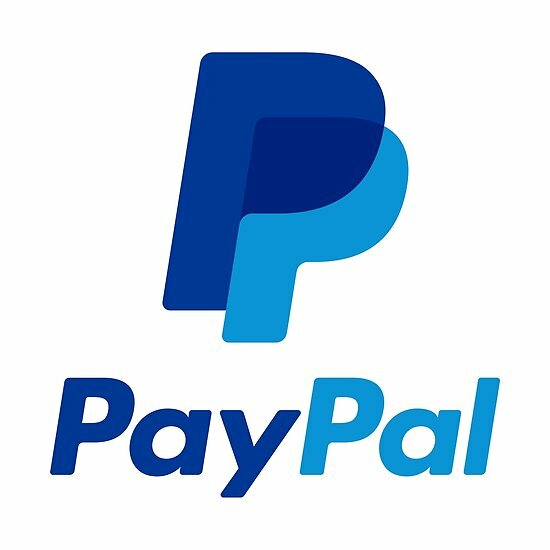 The club immediately placed him on the 7-day minor league disabled list, retroactive to April 18th, and more information should be forthcoming soon. While an oblique strain itself is not career threatening, the fact is that with Alfaro it is just one more in what is becoming a pattern of injuries. A year ago, Alfaro was unable to play at Reading after coming to the Phils as part of the big haul in the Hamels deal with the Texas Rangers due to a severe ankle injury suffered early last summer. He did recover in time to get six plate appearances over three games with the club's rookie-level affiliate in the Gulf Coast League. He has missed time already with that 2015 torn ankle tendon and two other injuries over his 6+ minor league seasons. That was Alfaro in the preseason, as quoted by Jay Floyd at 'Phillies Nation' back on April Fool's Day. Well, the April Fool's joke is now on Alfaro and the Phillies. A best-case scenario probably has Alfaro back in full action by around June 1st. These oblique injuries always take 3-4 weeks to heal, and a number of players have reinjured themselves trying to come back too soon, including the Phillies' own Cody Asche. This is no permanent setback for Alfaro or the organization, but it may be a harbinger of future club planning. Alfaro is a serious masher, and his bat should be able to play in Major League Baseball, even at a corner outfield spot or at 1st base. The Phillies, of course, would love to see him remain at catcher and become an offensive force behind the plate. That is what Alfaro would prefer as well. With the 2015 Paul Owens Award winner as the Phillies' top position prospect, fellow catcher Andrew Knapp, playing well at AAA Lehigh Valley, the practicality of a position switch may become a reality that both the team and the player will eventually have to embrace. The Phillies 3-0 victory over the San Diego Padres on Thursday afternoon behind a dominating performance by 22-year old Vincent Velasquez was a perfect summation of why the team is back at the .500 mark and showing improved competitiveness thus far in the 2016 season. The performance also highlighted why the Phils are only a .500 team, and will struggle to get much above that mark, possibly even to maintain that level for very long here in the early stages of their rebuilding program. Velasquez tossed the first complete game of his professional career, and the shutout was the third produced by the pitching staff in these first 10 games. As shown in this Tweet put out following yesterday’s game by Comcast SportsNet’s Corey Seidman, that staff is putting up some league-leading numbers to date. Velasquez has yet to allow a run of any type over 15 innings in which he has allowed just six hits and has a 25/3 K:BB ratio. In his first two starts, Jerad Eickhoff has a 1.50 ERA, and has allowed just nine hits over 12 innings with a 12/2 K:BB ratio. Jeremy Hellickson has a 1.54 ERA, having allowed just six hits in 11.2 innings with an 11/1 K:BB ratio. 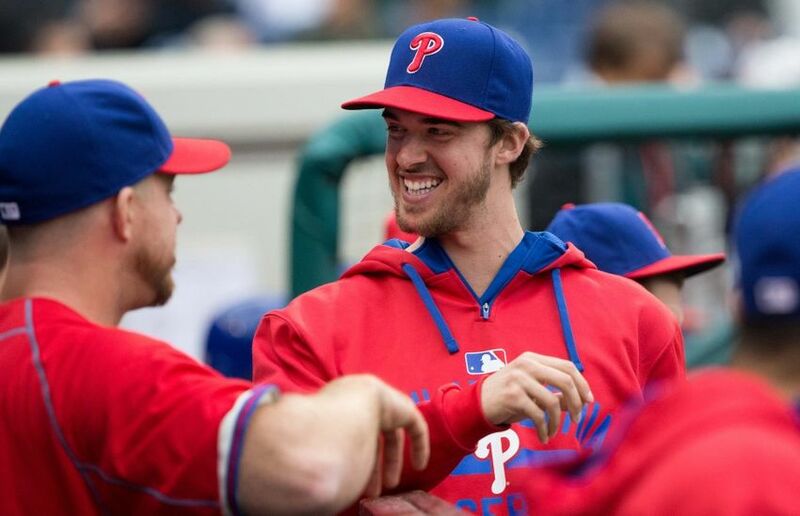 Aaron Nola has allowed just 10 hits in 14 innings with a 17/0 K:BB ratio. The bullpen, much maligned and rightfully so following the season’s first four games, all losses, has recovered wonderfully led by surprise closer Jeanmar Gomez. Seen as the perfect swingman, instead Gomez has, at least for now, solidified that closer spot by earning Saves in his first four opportunities. He has a 1.80 ERA, and has allowed just three hits over five innings. Also strong thus far out of the pen have been Hector Neris, who has allowed no runs and just one hit over his first 4.2 innings across five appearances. He has a strong 6/1 K:BB ratio. Lefty Brett Oberholtzer has a 2.70 ERA and a 5/1 K:BB ratio over 3.1 innings. David Hernandez, who could still end up as the longer term closer in the end, has now registered five consecutive scoreless outings since allowing three earned runs in an Opening Day meltdown at Cincinnati. But with all the quite obvious improvement across the pitching staff, the offense continues at an unacceptable pace. To date, the Phillies have scored just 29 runs over these first 10 games, a 2.9 runs-per-game pace that ranks 12th of the 15 teams in the National League. The current run-scoring pace lags behind even that of a year ago, nearly a full run behind the 2015 season, when the clubfinished just 27th in all of Major League Baseball with a 3.86 runs-per-game average. This current pace would have put them well at the bottom of the MLB rankings a year ago. Not only is the club just 12th in the NL in runs scored, but they are also just 12th in stolen bases and walks. That is really going to make things difficult as the season moves along, should those trends continue. 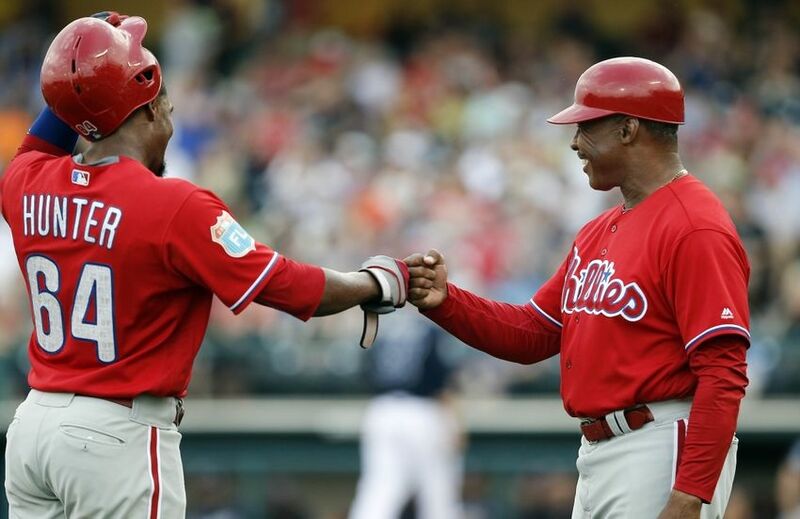 The Phillies do not possess much power in their current lineup, with only Maikel Franco and Ryan Howard as consistent longball threats. They are seventh in the league in homers, but five of the team’s seven dingers have come off the bats of those two power sources. There are three positions in particular where the Phillies are receiving little or nothing as far as offensive production is concerned. At catcher, Cameron Rupp is hitting for just a .217/.217/.304 slash line with no homers or RBI across his first 23 plate appearances. Carlos Ruiz has a home run, but has just two other hits over his first 16 plate appearances. At shortstop, Freddy Galvis is at a .182/.200/.303 slash line with just two extra-base hits and not a single stolen base attempt over his first 35 plate appearances of the season. The corner outfield spots, places where every contending MLB team receives production, have given the Phillies none. Peter Bourjos has 31 plate appearances with just a .172/.200/.310 slash line, and despite possessing good speed, he has attempted no stolen bases. Cedric Hunterand Tyler Goeddel have just one extra-base hit, a homer by Hunter, over their 36 combined plate appearances. The punchless Phils have tried to swipe a bag just eight times thus far over these first 10 games, and the results are ugly. Two of those attempts even came from players who will not and should not be running much, Ruiz and Darin Ruf. The speedy Cesar Hernandez has run four times, but been caught on three of those attempts. Hernandez, center fielder Odubel Herrera, and utility player Emmanuel Burriss own the Phils’ three successful stolen bases to this point. There are no easy answers for these Phillies, considering the talent of the players currently on the big league roster. An influx of talent from the minors later in the summer could inject some offensive spark, with the bats and legs of J.P. Crawford,Nick Williams, Roman Quinn, and Andrew Knapp. But barring major injuries, those players are not likely to see Citizens Bank Park until at least the summer months. 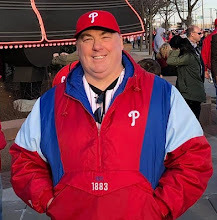 For now, the best that Phillies fans, and that outstanding pitching staff, can hope is that the Phils decide to push the running game more, finding success in producing runs in that manner. That, or some of those listed above have to begin hitting much more consistently, while Franco and Howard continue to provide real power. When he was selected with the 7th overall pick in the 1st round of the 2014 MLB Amateur Draft by the Phillies out of Louisiana State University, Bayou-born and bred Aaron Nola was a 21-year old who the club expected would be able to develop quickly and reach the big leagues in short order. That is exactly what happened, as little more than 13 months later he was promoted and debuted in Major League Baseball last summer on Tuesday night July 21st at Citizens Bank Park. Though the Phils dropped a 1-0 decision to the Tampa Bay Rays that night, the Nola debut was a complete success. He went six innings against the Rays, allowing just five hits while striking out seven and walking just one. His only blemish was a leadoff homer in the top of the 3rd off the bat of opposing starting pitcher Nate Karns, of all people. Nola would make 13 starts for the Phillies in 2015, a half-dozen of those as Quality Starts. In nine of the 13 he allowed the same or fewer hits than innings pitched. Known for his pinpoint control, Nola allowed one or fewer walks in more than half of those first-year outings. On a freezing cold Thursday afternoon at Whitaker Bank Ballpark in Lexington, Kentucky, the Phillies A-level affiliate Lakewood BlueClaws opened their 2016 season with a 7-4 defeat at the hands of the host Lexington Legends. When the BlueClaws starting pitcher, Franklyn Kilome, strode out to the mound the thermostat read 37 degrees on an overcast afternoon that blotted out any chance of a warming sun. The 18mph winds blowing out of left field made the temperatures on the field feel more like it was in the low-teens. The 20-year old Kilome was ranked by our staff here at TBOH as the Phillies' #7 overall prospect back in February. He is a tall and lanky native of the Dominican Republic whom the club signed as a 17-year old international free agent back in January 2013. A huge spike in the velocity of his fastball and improved command of his secondary pitches shot Kilome up all of the major scouting boards last summer, to the point now where he is considered as a Top 10 organizational prospect by evaluators across the game. Very little of that was on display on Thursday afternoon, as Kilome appeared overwhelmed by the weather conditions. He was crushed for five earned runs on five hits including a home run in just two innings pitched. He also walked four batters while striking out just two. Prior to the start, Lakewood skipper Shawn Williams had said that Kilome "was very impressive" during spring training. That spring performance and last season's results had led Williams to name the youngster as his starting pitcher on Opening Day in the minor leagues. While the weather was certainly a major factor for Kilome on Thursday, it didn't seem to affect 22-year old fellow Dominican Jose Taveras, who followed Kilome with three shutout innings over which the 6'4" righty struck out five and walked two. So the weather cannot be considered as the sole issue with Kilome's performance. 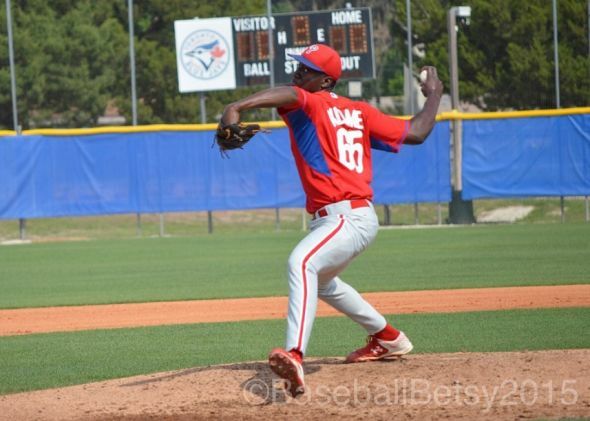 Kilome is next scheduled to take the mound for the BlueClaws on Tuesday night in Hagerstown, Maryland on what is likely to prove to be another cool evening. The Phillies would love to see their young prospect gut up some mental toughness and overcome the typical northeast April chill, and begin to bring some of the heat that he showed a year ago. On January 12th, Phillies general manager Matt Klentak made what seemed to be an uneventful free agent signing when he inked outfielder Cedric Hunter to a minor league contract with an invitation to spring training. Hunter had been a 3rd round choice of the San Diego Padres back in the 2006 MLB Amateur Draft out of a Georgia high school. He rose slowly through the Friars' farm system, and finally received his first big league shot at the start of the 2011 season. Over the Padres' first seven games that season, Hunter appeared in six of them, but did not start a single game. He went 1-4 with a run scored in those seven games, including his first Major League hit on April 5th, 2011 as a pinch-hitter in the bottom of the 6th inning against San Francisco Giants relief pitcher Guillermo Mota. But those seven games would prove to be the extent of Hunter's big league career. Our staff at the Fansided blog "That Ball's Outta Here" (TBOH) has just released our predictions for the final standings in each division, as well as our postseason predictions, including the 2016 World Series winner. I released my own predictions for the Phillies in the coming season as well. Our staff continued by releasing our predictions for some of MLB’s major award winners, including the Cy Young Award in each league, as well as the Rookie of the Year Awards. We’ll wrap our predictions today by releasing our picks for the front-runners for American and National League Most Valuable Player, as well as our pick for the first manager to be fired this season in Major League Baseball. A year ago, there was a definite tiered status to the AL MVP voting. The winner was Josh Donaldson of the Toronto Blue Jays. The 3rd baseman had an outstanding .297/.371/.568 slash line with 41 homers, 123 RBI and 122 runs scored. 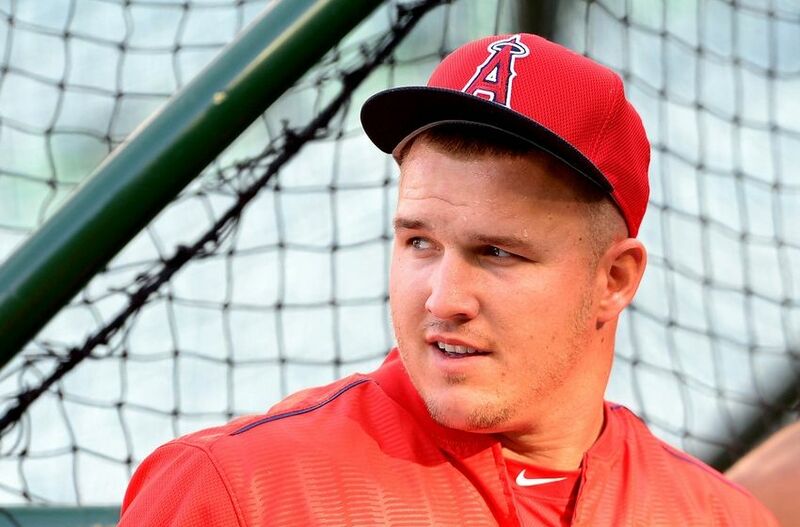 Donaldson was followed in the voting by the 2014 AL MVP, Mike Trout, who finished as the runner-up for the third time in his four full big league seasons. 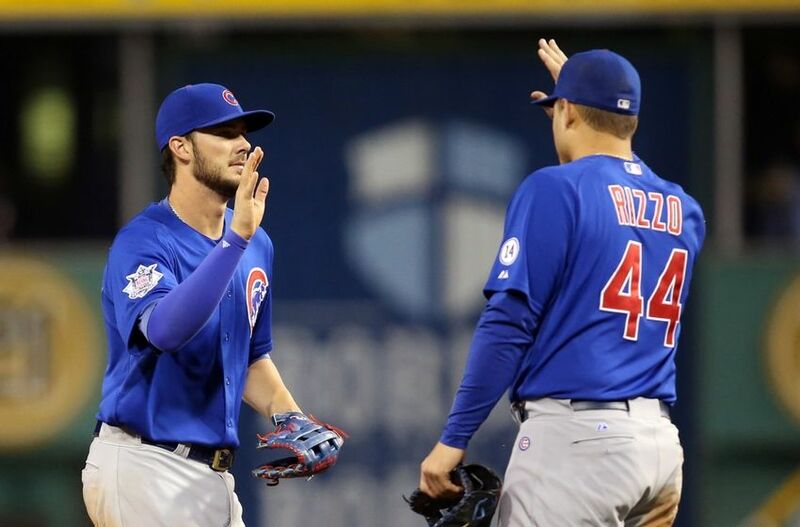 Our staff at TBOH has just released our predictions for the final standings in each division, as well as our postseason predictions, including the 2016 World Series winner. In addition, in my role as editor I have also released my own predictions for the Phillies in the coming season. A year ago, Bryce Harper of the Washington Nationals finally stayed healthy for a full season. The result was what has been anticipated since he was a teenager. Harper produced a .330/.460/.649 slash line, bashing 42 homers, driving in 99 runs, and scoring 118 times to become the unanimous National League Most Valuable Player.